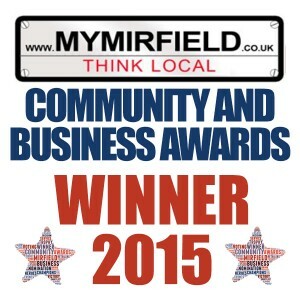 A massive thank you to all who took the time to cast your vote for us at the recent My Mirfield Community and Business Awards. We are pleased to announce we are the proud recipients of the Best Business/Tradesman Award, as voted for by YOU our valued customers. The awards were held at Dewsbury Golf Club and it was a fantastic night. The awards followed a delicious three course meal and the evening was full of great atmosphere and laughter. The set up of the awards was put together brilliantly and was a thoroughly enjoyable evening, topped off of course with our victory! It was great to have the many successful businesses of Mirfield recognised for the superb services they provide and also an excellent show of community spirit. Many thanks again for all who cast your votes for us, we are always happy to learn that we are providing a good level of service to all of our customers old and new and we look forward to meeting with you all again soon.